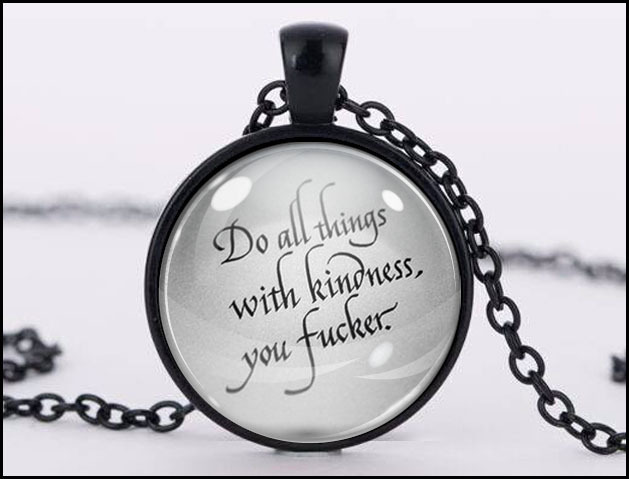 This listing is for ONE black 'DO ALL THINGS WITH KINDNESS' pendant. This design is part of our 'snarky' range. This range is intended to entertain and to amuse, it is not our intention to offend with these designs. Our pendants can be used on necklace chains OR pop them onto your keys making them a perfect gift for the fangirl/fanboy in your life! This pendant measures 25mm in diameter and utilises a glass dome to magnify the high quality image set beneath. **Colours may vary slightly from image shown.